This table is inspired by the richness and poignancy of the rituals around dining and the frustration that the structure of the typical table often places in the way of these rituals. 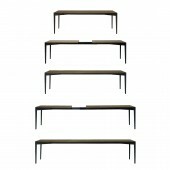 The table takes as its expressive point of departure the act of expanding the table, making it a taut, thin plane with a materially rich surface. The arrangement of people around a table is determined by the location of chairs, which, in turn, are governed by the location legs. Placing the legs at the extreme corners and coupling this with expandable leaves allows for the maximum variation of social patterns. Typically, this results in a structural compromise; here, however, it becomes a design opportunity. The expansion of the table is itself an event, with every leaf increasing the tables’ tautness. This project began in June of 2009 in Boston, MA, and finished in January of 2011. 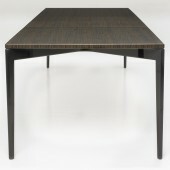 The Table was built by local craftsmen using traditional woodworking tools. 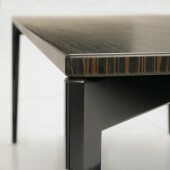 The tabletop material, a veneer made from recycled ebony furniture, is layered at the fileted edge, enhancing the tautness of the material as though it is stretched over the top; the legs are painted Maple. The leaves are attached to one another with a steel spline and are held tightly together by rare earth magnets allowing the Top to retain its structural integrity. The legs and the apron of most tables are its structure. The top is merely a surface supported by the legs and plays no structural role. This results in either: 1) Table legs competing with human legs because they are far inboard of the edge of the table so the apron misses our knees, or 2) An apron that requires you to slide your chair completely out to stand up because it is located at the outer edge of the Table. We wanted to design a table that used the top as a structural element in order to eliminate the apron while placing the legs at the extreme corners to allow for the most spontaneous sitting arrangements. The challenge was compounded by making the table expandable and integrating the leaves structurally into the top. The "taut" Table Dining Table by Butz + Klug Architecture is a Nominee in Furniture, Decorative Items and Homeware Design Category. The "taut" Table Dining Table by Butz + Klug Architecture is Winner in Furniture, Decorative Items and Homeware Design Category, 2012 - 2013. 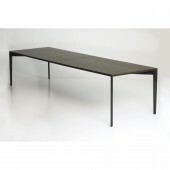 Did you like The "taut" Table Dining Table? 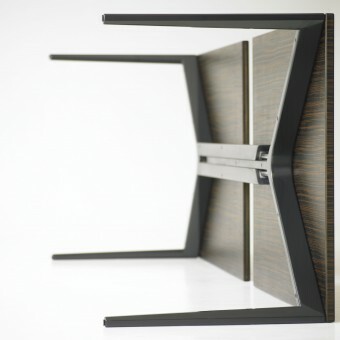 Help us create a global awareness for good furniture design worldwide. 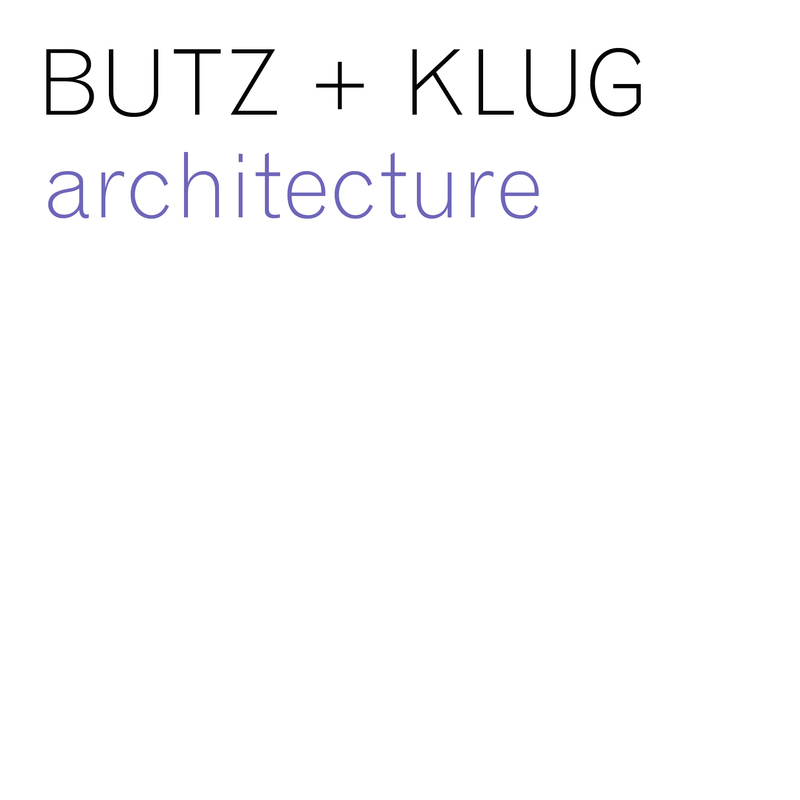 Show your support for Butz + Klug Architecture, the creator of great furniture design by gifting them a nomination ticket so that we could promote more of their great furniture designs.